They lead a life of luxury as the youngest members of the world’s most famous reality television family. And privileged Kendall and Kylie Jenner enjoyed experiencing the delights of a brand new playground as they hopped aboard jet skis alongside half-brother Brody on day three of the Kardashian clan’s lavish Greek holiday in Mykonos. Donning their swimsuits and hitting the water, Kendall, 17, and Kylie, 15, treated their Twitter followers to numerous envy-inducing snaps while sunning themselves on the massive yacht adrift the Aegean Sea on Saturday. The not-so-typical teenage siblings grinned from ear-to-ear as they whizzed around on their jet skis surrounded by a picture-perfect landscape, accompanied by their doting brother. Kendall flaunted her enviable 5ft10” frame in a printed bandeau bikini, which she covered with a stylish billowy white blouse. Kylie looked confident in a floral string bikini and blue baseball cap, later changing into a white bra-top and a colourful paisley maxi-skirt. After playfully whizzing around the ocean, the girls and Brody, 29, joined the rest of the clan back on board the luxury vessel – showcasing their daring sides by jumping into the sea. After drying off on the yacht, the pretty teenage siblings then appeared to enjoy an impromptu modelling session. Posing up a storm in a number of ‘selfies’, the reality TV stars used the vessel as their catwalk as they strutted their stuff in a variety of poses – before later posting the snaps on their respective Instagram pages for all to see. But while Kendall has already secured a successful career as a catwalk queen, she recently admitted her younger sister does not have the same aspirations in life. She explained: ‘Me and Kylie are sisters, but not everything we can always do together. ‘She’s not trying to be a model. She’s trying to be more like a personality, so…we’re trying to kind of separate ourselves – not in a bad way. We’re not fighting!’ Also seen on Saturday, was Khloe Kardashian holding her three-year-old nephew Mason Disick, who was clad in a white mesh vest, white shorts, and a beige trilby hat. The former X-Factor host braided her brunette locks and covered her black bathing suit with a sleeveless magenta dress. Her older sister Kourtney wore her hair in a braided crown and donned a beige-patterned shirt and matching shorts and knee-high gladiator sandals. The 34-year-old reality star cradled her nine-month-old daughter Penelope, who matched her mother in a beige-printed frock. 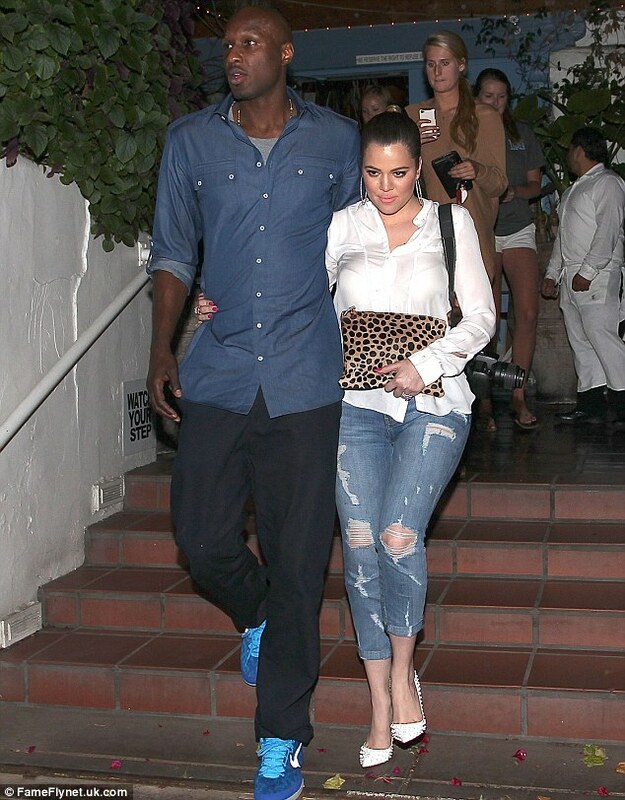 Meanwhile, the family matriarch Kris Jenner, 57, opted for a strapless blue floral jumpsuit. Putting on an amorous display, husband Bruce romantically dipped Kris as they danced together on deck after enjoying a somewhat nervous whizz around the ocean on their jet skis. The famous family arrived in Mykonos on Thursday after flying via the Greek capital Athens. The ever present E! camera crews have been capturing every aspect of their idyllic Mediterranean vacation for the eighth season of Keeping Up With The Kardashians. Local media claim the Kardashians are expected to remain on the island for 10 days. Kim Kardashian was no doubt relieved on Friday after finally being granted a divorce from ex-husband Kris Humphries. So there was plenty to celebrate to the Kardashian-Jenner clan as they attended a large family dinner to mark Kourtney’s 34th birthday. Following her actual birthday on Thursday, mother-of-two Kourtney was surprised with a meal at Greek restaurant at Taverna Tony in Malibu on Friday night. Following her court appearance earlier that day, mother-to-be Kim showcased her bump in a monochrome shift dress and fringed waistcoat, which she teamed with a pair of white pumps. The birthday girl arrived at the bash with partner Scott Disick and their three-year-old Mason, with baby Penelope presumably staying at home with a babysitter. While Kourtney showed some leg in a black mini dress and heels, her boyfriend Scott pushed the style boundaries in some leather trousers and a black sweater. Meanwhile, their adorable son Mason wore a matching mocha knitted sweater and trousers. Kris Jenner Slams Bruce Jenner Divorce Story! The ultimate momager needs to clear the air once more. Via her blog, Kris Jenner is slamming the latest cover story of Star, which claims that the famous matriarch, 57, is “drunk and alone, ” with husband Bruce Jenner planning to file divorce papers. “My husband and I have been married for over 20 years and I love him. We are so lucky that we get to have so much fun together and with our kids,” writes Kris of Olympic champ Bruce, 63. “I also love that Bruce and I get to create so many amazing memories not just for ourselves, but also for our kids and grandkids. 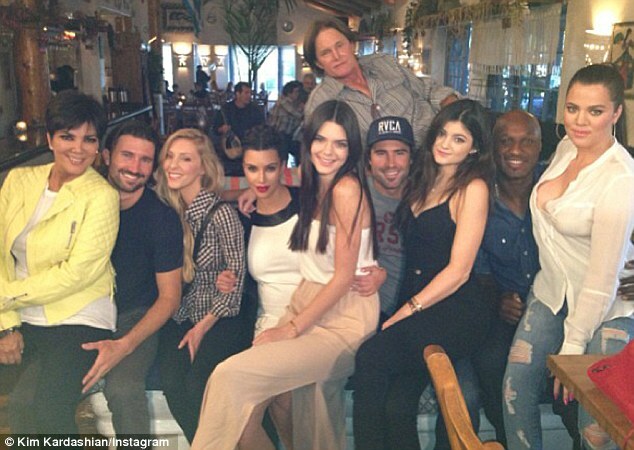 We are truly blessed.” Bruce, of course, is stepfather to kids Kourtney, Kim, Khloe and Rob Kardashian and father to Kendall, 17, and Kylie, 15. Star’s story reports that Bruce allegedly called the family together on Easter Sunday sans Kris to announce his divorce plans. “The conversation that Bruce supposedly had with our kids, NEVER happened,” Kris continues. She’s part of one of the most photographed families in the world. And the camera clearly loves Kendall Jenner as she proved once again while taking part in a photo shoot for Harper’s Bazzarr in Los Angeles. Showing she’s well and truly stepped out of her Kardashian sister’s shadow. The 17 year old looked every inch a high fashion model in the stunning black gown. Her long brunette hair had a lightly wild feel to it as it fell down her back. While she experimented with a darker look featuring lashings of black eyeliner. As she turned around the gorgeous design of the dress could be fully seen – showing off most of her back of the dress had a low scoop with ruffled detail. she shared another snap from the shoot.